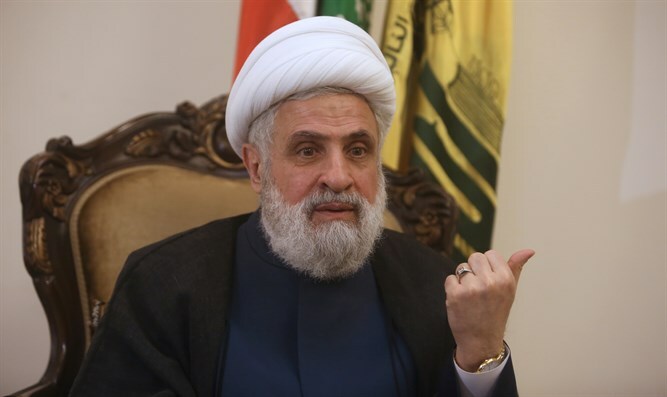 Deputy Hezbollah leader Naim Qassem warns that Iran will respond to alleged Israeli air strike on military base in Syria. Deputy Hezbollah leader Naim Qassem warned on Monday that Iran would respond to an air strike on a military base in Syria which was attributed to Israel and in which seven Iranian personnel were killed. "By bombing the T-4 airport, Israel wanted to create an equation that shows that it controls the rules of the conflict, but we do not accept this. We expect an Iranian response against Israel, but we do not know its nature or details,” he claimed. "Israel is not ready for an all-out war, and therefore it is waging a campaign between the wars. The axis of resistance will not permit for its movement in Syria to be restricted," added Qassem. On Friday, Hezbollah leader Hassan Nasrallah warned Israel that its air strike in Syria has put it in direct confrontation with Iran. "The Israelis committed a historic mistake... and put themselves in direct combat with Iran," Nasrallah warned in a televised address. Both Russia and Iran blamed Israel for last week’s attack, claiming that two Israeli Air Force F-15 fighter jets had entered Syrian airspace from Lebanon. While Israel never officially claimed responsibility, U.S. officials told NBC News that Israel had consulted with the U.S. prior to the attack.